A classic dessert of crisp and crumbly shortbread crust with tart and refreshing lemon filling and a liberal drizzling of snowy white confectioners sugar on top. Best of all, it is very easy to prepare. Truly a great treat anytime of the day! 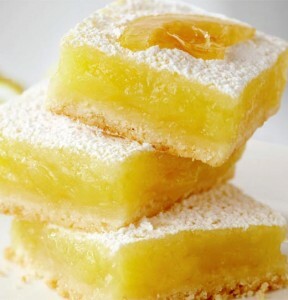 Here is an easy dessert recipe for Tangy Lemon Bars. 1. Preheat the oven to 350°F. Grease a 9 x 13-inch baking pan. 2. Make the crust: In a medium bowl using an electric mixer, beat the butter, confectioners' sugar and vanilla until fluffy, about 1 minute. Gradually add the flour, beating until well combined and mixture holds together and forms a dough. Press the dough over the bottom of the prepared pan. 3. Bake for 15 to 20 minutes, or until light golden and firm when touched. 4. Make the topping: In a medium bowl using an electric mixer on medium-high speed, beat the eggs, sugar, flour, baking powder, lemon zest, and lemon juice until well blended. Pour the mixture over the crust. 5. Bake for 25 to 30 minutes, or until the top is golden brown and the filling is set. 6. Cool the lemon bars completely in the pan set on a wire rack. Dust with confectioners' sugar before cutting into bars.